"I do a lot of networking, so having the ability to literally speak to someone eye to eye with the power adjustable safe seat elevation is fantastic." Stewart Lundy uses his 4Front® Power Chair with safe seat elevation to make a living through storytelling while also maintaining his personal sense of style. 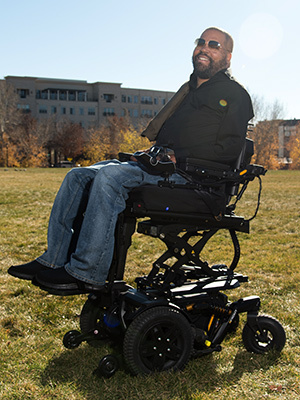 Every power chair user has a unique story, and Stewart Lundy is no exception. Stewart enjoys a good cigar and an even better narrative, impassioned by the stories of others. Originally from Camp Springs, Maryland, Stewart currently lives in Denver, Colorado, with his wife, Marci. Stewart became paralyzed after a diving accident in 1982 at just 14 years old. Although his story took a dramatic turn at a young age, Stewart continues to pursue his interests. 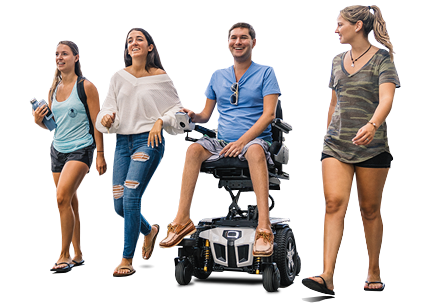 With his Quantum® 4Front® Power Chair, he lives a full and active life, with just a touch of flair. A self-described people person, Stewart is inspired by the stories of others. He makes a living in the art of storytelling too, working as an actor, producer, sound engineer and video editor. “Everyone has a story to tell,” Stewart said. His 4Front helps Stewart a lot in his work, allowing him to see things from the same angle as his camera man. The Q-Logic 3 controller with Bluetooth® also helps Stewart to effortlessly use his computer. Stewart loves the turning radius on his power wheelchair, as well as the 10” of power adjustable safe seat elevation at 3.2 mph. “I do a lot of networking and I find myself at cocktail parties, so having the ability to literally speak to someone eye to eye is fantastic,” Stewart said. Stewart expresses himself in other ways too. He portrayed President Roosevelt in a play last year, put on by the Phamaly Theatre Company, an organization comprised of individuals with disabilities. Stewart also serves on the board of directors for Phamaly. Stewart recently completed an editing course on movie trailers and is currently partnered with a local production company. With these opportunities, Stewart hopes to do a lot more work in cinema and media in the future.